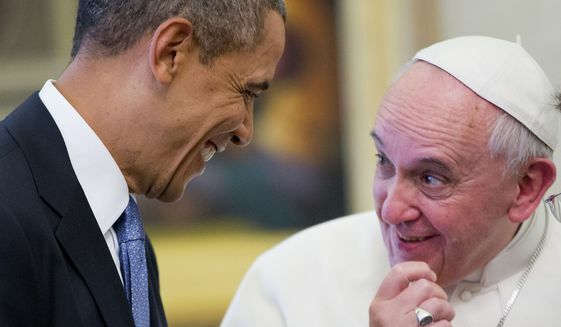 While the media is busy trashing Trump for not defending their fearless leader Obama, the Pope is busy calling out Obama for trying to trash him. It seems Barack Hussein Obama is at it again calling out his dogs to devour another opposing figure that does not fit in with his Muslim ideology. He invited a number of abortion, gay marriage, and transgender social justice activists to the welcoming ceremony of Pope Francis who was scheduled to arrive next Wednesday. According to the Wall Street Journal, Pope Francis found this “especially irritating”. Obama made no effort to invite any Christian based anti-abortion, anti-gay marriage or anti-transgender activists. A senior Vatican official stated that photos of Pope Francis surrounded by these activists could wind up giving the false impression that he endorses such things as abortion and gay marriage. I’m sure Obama never thought of that. After all we heard Megyn Kelly scream “Obama is a Christian”, how many times now? The activists included the likes of Sister Simone Campbell, who wants to rewrite Catholic teachings on abortion; Bishop Gene Robinson, who strongly supports gay marriage; and Mateo Williamson, former co-chair of the Transgender Caucus for Dignity USA. It is obvious to all that the social ills Obama is out to champion are totally opposite of Christian values. It is also apparent that Hussein Obama has his own radical ideology that does not align with Christian values, although the media is presently waging a war against any who would dare question Obama’s Christianity. Does anyone find it ironic that Obama has purposely invited those with opposing and radical views? Perhaps he was merely trying to drag the sinners to church to have a born again moment? Or perhaps he was purposely slapping the Pope and his religion in the face? He certainly didn’t consider how, as a senior Vatican official said, photos of Pope Francis surrounded by these activists would give the false impression that the Pope endorses such things as abortion and gay marriage. So I find it hilarious that while the pundits are attacking Trump for not questioning a town hall attendee for calling Obama a Muslim, they are also busy talking about this and wondering whether Obama would ever consider inviting moderate Muslims or — better yet — homosexuals Jews to visit with Saudi Arabian dignitaries or Iranian negotiators. The puzzle is beginning to take shape as all four corners are now in place. Is it possible that the preplanned event to put the pope in an embarrassing light has been upstaged by a town hall question that has the media hammering – he isn’t a Muslim he’s a Christian damn it! Or as we fill in the center, will we find a totally different picture? One no one saw coming? After all Obama and Pope Francis are in agreement on many things. Like climate change, and they both have Jesuit upbringings. Remember all things you see, are not as they appear. Question everything. Especially since although offended by the other guests, Pope Francis is still scheduled to arrive and the welcoming will go on. ← Will Someone Tell The Media “If You Build It They Won’t Come! Hey There. I discovered your blog using msn. This is a really well written article. I will make sure to bookmark it and return to learn extra of your helpful info. Thanks for the post. I will definitely comeback.